Unable to cope with almost dying, Thomas sits beside Minho and cries for half an hour. When he calms down, Thomas tells Minho they have to find Alby. Minho says that Alby must be dead already because they didn’t inject him with the Serum before sunset. Thomas asks if they ever tried giving a stung Glader the Serum after sunset. Minho realizes they’ve never tried because stung Gladers have either managed to get back into the Glade before the Doors closed or they weren’t able to get back in time and presumably died within the Maze. Minho says they have always just assumed that the Serum wouldn’t work after sunset. Gaining new hope, they head to the spot where they left Alby. Minho’s lack of hope in the effectiveness of the Serum reveals his deep-seated belief that any change in routine is futile. But once Thomas shows him the flaws in his assumptions about the futility of change, Minho gains a renewed sense of hope. After having these experiences in the Maze and seeing firsthand the value in Thomas’ new methods and fresh perspectives, Minho may finally learn the importance of change. On their way to Alby, Minho says the Serum is short for the Grief Serum. He says that the Creators send them the Serum through the Box. When Minho and Thomas arrive at the spot, the Door is already open and they see Newt. Too exhausted to help get Alby down, Thomas shows Newt where Alby is hanging and then he and Minho head into the Glade to rest. By staying hopeful and trying new methods, Thomas saves Alby’s life. Now Thomas may be able to convince Alby and the other Gladers that change, rather than something just frightening, is in fact valuable. As they walk to the Homestead, all the Gladers gawk at them with awe. Thomas goes to sleep but is woken up by Chuck a few hours later, who tells him that Alby has survived but is now going through the Changing. To everyone’s surprise, Thomas survives the Maze, perhaps inspiring hope in the Gladers just as he did in Minho. With this hope, the Gladers may finally be willing to change their flawed approach to solving the Maze. Plaue, Ethan. "The Maze Runner Chapter 22." LitCharts. LitCharts LLC, 22 Jul 2015. Web. 22 Apr 2019. Plaue, Ethan. "The Maze Runner Chapter 22." LitCharts LLC, July 22, 2015. 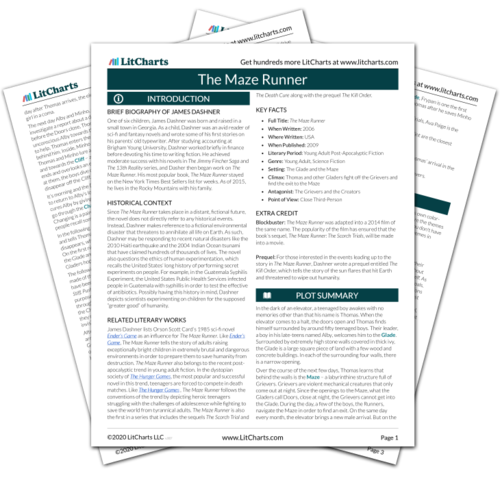 Retrieved April 22, 2019. https://www.litcharts.com/lit/the-maze-runner/chapter-22.